The Gathering and Feast of Seven Days, known as the Jamayi and referred to as ziyaret, “the pilgrimage”, lasts seven days between October 6th and the 13th of October. 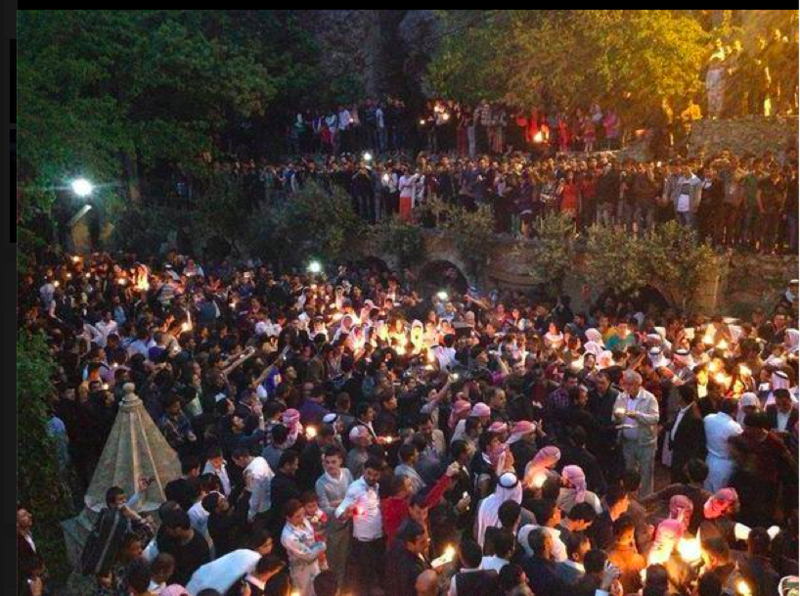 It is a sacred time when all Yezidis attempt to make the pilgrimage to Lalish in order to to unite as one people at their holiest shrine. Prevailing belief has it that there is an upper or heavenly Lalish where the Seven Great Angels gather at this time to shower there blessings on those assembled at the lower or worldly Lalish. Throughout the week-long event friendships are rekindled and important meetings take place among the Yezidi leaders, with both the Mir and Baba Sheikh in attendance. The two most important events of the Feast of Seven Days are the Evening Dance and the Sacrifice of the Bull. The Evening Dance is performed by religious dignitaries every evening just after sunset in the court of the Sanctuary. Fourteen, or twice seven, men dressed in white, the color of purity, step to the music of qewels. They proceed in procession around a sacred torch that represents both the Sun and the Supreme God.. They are led in this walk by the head of the Faqirs, who is dressed in a black fur cape and conical hat. These are very sacred articles allegedly once worn by Sheikh Adi himself. The Sacrifice of the Bull takes place on the 5th day of the week-long event. It signals the arrival of Fall and carries with it the Yezidis’ prayers for rain during the coming winter and a bountiful Spring. After guards fire a special gun salute, a small bull bursts forth from the main gates of the Sanctuary. The bull is chased by men of the Qaidy tribe up a hill to the Sanctuary of Shiekh Shem. Here the bull is caught and slaughtered. Afterwards, the meat is cooked and distributed among all the pilgrims present at Lalish. During the week there are also continual baptisms of children and holy objects in the water of the White Spring. The silk cloths that represent the seven angels and normally cover their tombs in the Sanctuary are also re-baptized for the coming year. The final rite is the baptism of the “Throne of Shiekh Adi.” This is a wooden object resembling a funeral cot and covered with red silk. It is also baptized in the White Spring.